'Competing Imperatives: Middle East Mini Forum' -Revisiting and Updating the Status of Peace talks. 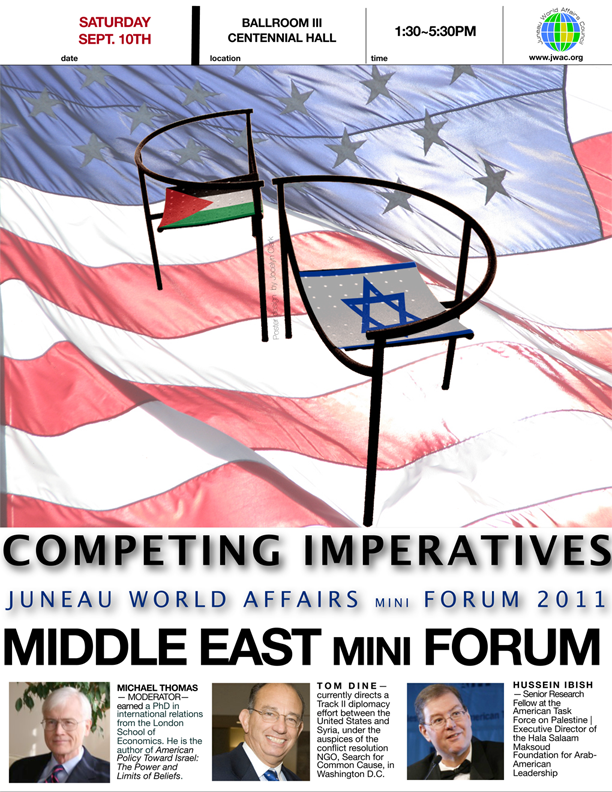 Our first ever Mini Forum will serve as a review and update from our 2009 'Fall Forum on the Middle East.' Our panel will include Hussein Ibish and Thomas Dine, and will be moderated by Michael Thomas. The program will come in two parts: First, individual talks on the last two years' impact on the region, followed by discussion and audience participation. Second, a panel discussion of US policy alternatives given recent developments will take place, with questioning to follow. Mini Forum Moderator Michael Tracy Thomas is a retired attorney who spent five years in the Army and 24 in private practice in Alaska and Washington before returning to school, ultimately earning two degrees including a PhD in international relations from the London School of Economics. He is the author of American Policy Toward Israel: The Power and Limits of Beliefs. The book analyzes domestic political influences on American policy toward Israel, including Jewish and Christian groups and presidential leadership. He continues independent study of American policy in the Middle East, and of international humanitarian law, including recent meetings with the region’s political leaders. He has spoken on American policy at the Royal Institute for International Affairs (Chatham House) and at the LSE Speakers Series, and written pieces for The World Today, Commentary, and the Washington Post. Hussein Ibish is a Senior Research Fellow at the American Task Force on Palestine and Executive Director of the Hala Salaam Maksoud Foundation for Arab-American Leadership. He makes frequent radio and television appearances, and has written for the Los Angeles Times, the Washington Post and the Chicago Tribune, among others. From 1998-2004, Mr. Ibish served as Communications Director for the American-Arab Anti-Discrimination Committee, the largest Arab-American membership organization in the United States. From 2001-2004 he was Vice-President of the National Coalition to Protect Political Freedom. He has a Ph.D. in Comparative Literature from the University of Massachusetts, Amherst. He is editor and principal author of three major studies entitled Hate Crimes and Discrimination against Arab Americans covering 1998-2000; Sept. 11, 2001-Oct. 11, 2002; and 2003-2007. His most recent book is What’s Wrong with the One-State Agenda? Why Ending the Occupation and Peace with Israel is Still the Palestinian National Goal. Thomas Dine has had a 49-year career in foreign affairs and the politics of U.S. foreign policy.He currently directs a Track II diplomacy effort between the United States and Syria, under the auspices of conflict resolution NGO Search for Common Ground, in Washington DC. He has visited Damascus nine times in the last three years, most recently after the street violence began in late March 2011. He is also a senior adviser to America's Arab language channels Alhurra Television and Radio Sawa. Mr. Dine commenced his career as a Peace Corps volunteer in the Philippines (1962-64), and went overseas again to serve as personal assistant to Ambassador Chester Bowles at the American Embassy in New Delhi, India (1967-69). Afterwards, he worked on foreign policy legislation in the U.S. Senate for a decade as legislative assistant for foreign policy to Senator Frank Church (1970-74), senior national security director for the Senate Budget Committee (1975-1979) and defense/foreign policy adviser to Senator Ted Kennedy (1979-80). He subsequently served in executive positions - for 13 years as executive director of the American Israel Public Affairs Committee (1980-1993), assistant administrator for Europe and Eurasia at the U.S. Agency for International Development (1993-97), president of Radio Free Europe/Radio Liberty in Prague, Czech Republic (1997-2005), and CEO of the San Francisco-based Jewish Community Federation (2005-2007). He holds a BA from Colgate University, an MA in South Asian history from UCLA, and an MLA from Johns Hopkins University. He and his wife Joan have two daughters and three grandchildren, with a fourth on the way.